Learning Python for Data Science: Why learn python for data science? In this tutorial we are going to understand the importance of Python as Data Science programming language. Python is most preferred programming language for Data Science because it comes with many libraries for developing machine learning programs. This programming language is also very easy to learn and it can be learned in 15 days or in a month. So, programmers from other fields can also learn Python very fast. In this article we are going to explore the Python programming language as data science programming language. Python is a widely acclaimed object-oriented programming language well known for functional programming patterns. It is a powerful language that can handle all types of programming tasks ranging from coding for web apps, embedded systems and data mining. It has gained a huge reputation as a language for data science as well. The emergence of Python as a programming language for data science has not been an accidental one. It consistently left other data science platforms behind with unmatched efficiency. No wonder, it is often considered as the Swiss knife of programming for data science. Let's look at a few statistics. The R on Kaggle, one of the most acclaimed data science platforms was overtaken in competition by Python in 2016. As per the annual poll held in 2017 on KDNuggets, it became the most used tool by data scientists all over the globe. As per the latest report furnished in 2018, a whopping 66% of data analysts said that they use Python regularly. Why Python became so invincible as a programming language for data scientists? What are the key reasons for aspiring data scientists and analysts to learn Python? Let's explain some of the key reasons. Why one should learn python for data science? Python is one of the most powerful programming languages for data science due to availability of several machine learning and general purpose libraries. Python is also an easy to learn programming language which takes less time to learn and master. This is one of the important reasons many developers from different streams are learning Python programming. But data science is not just Python, it request many technologies, mathematics and algorithm to learn to become productive data scientist. Python is best suited language for development of applications for data science, artificial intelligence and deep learning. Here we are giving you the details why one should learn this programming language for data science. Here are the major reasons one should learn Python for data science and deep learning. Python is mature programming language with large collection of libraries to develop machine learning and data science applications. Python programming is free, open source and powerful programming language. Python is easily programming language and can be learned with less effort as compared to other programming languages. Python comes with many libraries for data pre-processing, manipulation, analysis and visualization. Python provides many libraries for mathematical computation which is necessary for developing any machine learning model. Python at present is used by more than one-third of data analysts and what drives most of them to favour Python is the easy to understand syntax compared to most other languages used by data scientists. A lower learning curve is the most important reason behind the popularity of Python. Python comes with a coding tool called Jupyter which allows writing code and text content for a website and allows the developers and data scientists to work in collaboration. It makes things simple by working on the web server while delivering results in HTML and integrating the code with the web page. There are other Python IDE linke Sublime Text 3, Atom, Thonny, PyCharm, Visual Studio Code, Vim, Spyder etc. which can be used for development and testing of Python based applications. These IDE helps developers in quickly coding, testing and running it with Python execution environment. The real power of Python lies nowhere but within the robust libraries that it offers for data scientists. It comes loaded with a whole array of powerful libraries for different tasks including scientific computing, data analysis, data visualization and many others. Let's have a look at these libraries. Numpy: NumPy which is basically an abbreviation of NumericalPython is a core library for Data Science. This library is for scientific computing and provides all tools to integrate C, C++ etc besides allowing data scientists to use the library as a multi-faceted container to deal with generic data for carrying out a variety of Numpy Operations and special functions. Matplotlib: Matplotlib is a robust data visualisation library in Python. It allows a wide range of uses across web apps, servers, Python scripts, shell, and several GUI toolkits. Scikit-learn: Scikit learn gives Python an edge by allowing data scientists to implement machine learning while using Python. The library comes as free and offers a variety of effective and efficient tools for the purposes of data analysis and data mining. The library allows using a wide variety of algorithms as per the needs of the project. Seaborn: This library in Python will help you use statistical graphics and it comes with a very intuitive interface to make your job easier in presenting statistics in a high-impact graphical manner. Pandas: Pandas is one of the most important libraries in the Python ecosystem for data science. This library helps data scientists in data manipulation and data analysis with various tools and modules. The large collection of libraries for various purposes makes development of machine learning and deep learning programs much easier. The TensorFlow is library from Google which is very famous machine learning and deep learning framework. Python programming language is also used for writing deep learning applications in TensorFlow. So, it is good idea to learn Python programming language for data science and deep learning application development. The Python programming language is also most used framework and it is being learned by new developers around the world. Python has become quickly popular among data scientists and it could beat the popular languages for data science such as R just because it is more scalable and fast-paced. Thanks to this tremendous scalability many major platforms and applications including YouTube switched to Python. Python is a more flexible language as well, especially in dealing with different contexts of data analysis problems. Python programming language comes with 1000s of libraries developed by large number of developers around the world. Most of the Python programming language libraries are open source and comes with powerful features. It can easily be downloaded and used in Python projects. The Python language ecosystem for data science also boasts of a robust worldwide community of developers and data scientists who continue to make value additions. You always have access to the latest and advanced tools and processes thanks to this brimming community of data scientists and their continuous inputs. Python is a language known to offer superb graphics libraries with an overwhelming range of data visualization options. From understanding data and fitting into web-ready plots to creating complex and multi-layered graphics to accommodate data analysis into an impactful graphical layout, Python allows you to do everything with ease. Now that the power of Python programming language is already clear to you, it is time to understand the basic and easy steps for learning Python. Let's explain the 5 easy steps of learning Python for data science. Let's start with the Python programming basics and some introductory knowledge about data science. Let's figure out the learning process below. Start using Jupyter Notebook that comes loaded with Python libraries to make you learn a few things. To run the code select the code block by clicking on it and then press Shift button and press enter button. This will run the code and print the output. In our case program is creating an integer variable with 10 as data and then printing it (10) on console. This way you can use Jupyter Notebook to run your Python code. Check our Python Tutorials home page for many step-by-step tutorials of Python programming langauge. Join in a Python community to get acquainted with various concepts and inputs. The members-only Slack discussions of roseindia.net is a good choice. Create an account in Kaggle as well. Learn the Command Line Interface (CLI) that allows you to run the scripts and test them faster. 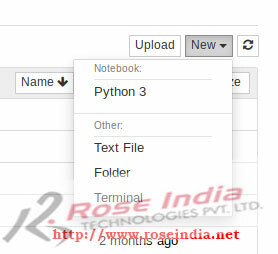 You can easily install Python tool on your operating system and then use any text editor to create program. Developer can use terminal and python interpreter to run the program. There is nothing like hands-on learning for a young aspiring mind who want to make a start. It won't take long for you to be ready to develop simple Python projects. Follow these tips below. You can start learning Python from the basics like making simple program to understand the basics of programming language. 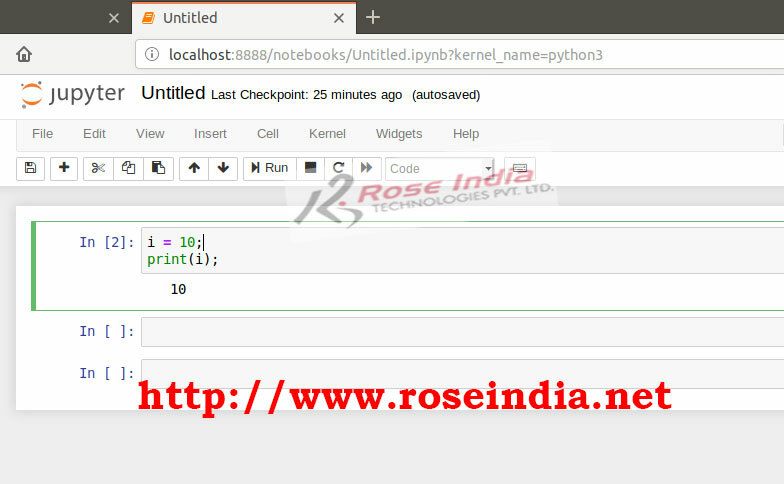 Learn the syntax of Python, looping, statements etc. in Python before starting with machine learning. At first start with simple projects like developing a program to show weather data from the web or a simple calculator for online expenses. These mini projects will give you a basic understanding. Slowly you can move to more complex web scripting for complex data. At this stage besides hands-on learning read a lot of guidebooks, blog posts, and knowledgeable contents that can make you learn about best practices. When working with the databases use SQL as it is the most used database for data scientists in general. At this stage, you need to learn a few important libraries. Instead of learning too many foci on the 3 most popular and useful libraries such as NumPy, Pandas, and Matplotlib. While the first two will help you explore, analyse and structure data in numerous ways the last one will help in creating graphics visualisation with the data. Here are some tips to learn these libraries. Reach out to robust Python community of experts across Quora, Stack Overflow, and on our website. Start with the FAQ for each library and project issues. Bang on the Git platform to track the versions and the changes made to the code at different levels. This will help you rectify and rehearse. The above-mentioned discussion is just to explain the very basics of Python language for data science. Obviously, you need to learn advanced data science techniques using Python as you progress learning the language, best practices and tools. Python comes with many machine learning libraries and deployment platform for distributed machine learning. Python can be used to develop machine learning, deep learning and artificial intelligence applications which can be deployed on large scale in production environment. Here are the tutorials for learning Python programming language from beginning. You will learn Python programming language by installing Python and through step-by-step tutorials. What are prerequisites of machine learning? Is machine learning set to disrupt the finance industry? What are the prerequisites to learn deep learning? What are prerequisites for learning Artificial Intelligence? These tutorials will help in learning Python for machine learning and mastering with many examples.